Counterpoint's gameplay was developed through a rigorous cycle of play-testing, refining, and replaying, and its visual design went through just as many changes. We needed a color-based system to differentiate between object, person, place, and scenario cards, but we did not want them to become visually distracting. Our early experiments with different colors, icons, striped patterns, and black backgrounds produced results that, while interesting, did not capture the idea of our product both as a game and a piece of design. We finally landed on a design that combined branding, pattern, and pleasant primary colors into a subtle, minimalist appearance. 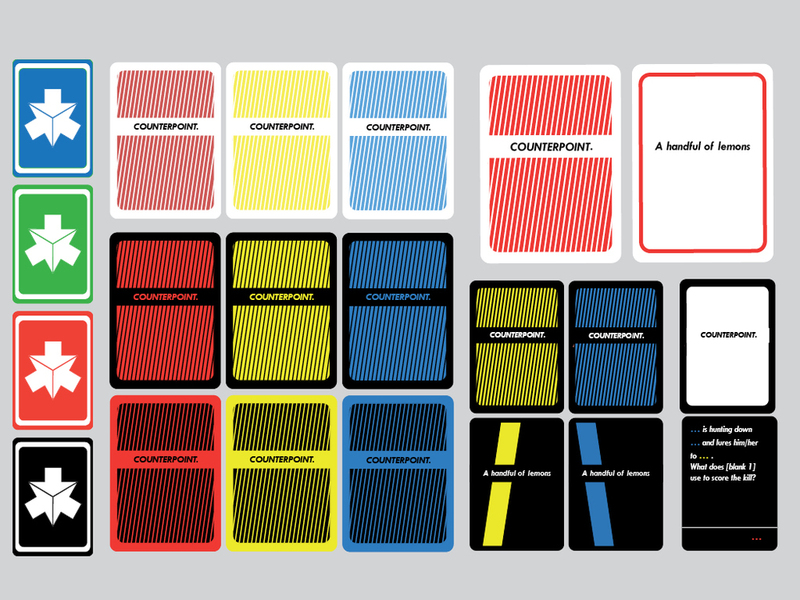 Applied to both the backs of the cards and the foamcore box, this repeated pattern of name and color gave the whole Counterpoint set a cohesive graphic element, making it as fun to look at as it was to play.